I usually bake gingerbread and sugar cookie men (and women and dogs and stars and such) to hang on my tree, a tradition that has gone by the wayside thanks to a little giant puppy who eats ornaments, edible or not. 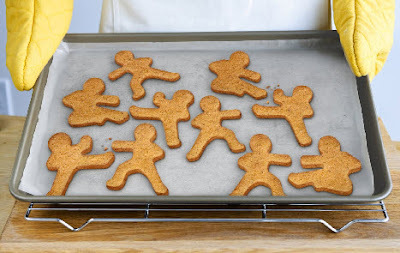 Maybe I'll make a gingerbread ninja garland instead (to be hung very high on a wall, of course), or make a batch to bring to Stacey's Annual Latkes and Cookies Party. I'd love to try this gingerbread recipe from Gesine Bullock-Prado.